Find out how to upgrade your customers' Windows 7 hardware to meet performance demands by using ReadyBoost, changing BIOS settings, adding RAM and upgrading their hard disks. No matter how high the performance of your computer, sooner or later it will start to slow down as newer programs demanding faster hardware show up on your desktop. Chances are performance demands will exceed your computer's capabilities before you or your company is ready to pop for a replacement computer. This chapter will help you make the hardware changes -- large or small -- you need to get the most work and useful life out of your computer. We'll discuss how to upgrade and install hardware, add a second monitor, connect new and old hard drives, and add memory. The single most helpful thing you can do to make your Windows 7 computer run at peak speed is to give it enough system memory (or RAM, short for random access memory). Just as a reminder, your computer uses two types of memory: hard disk space and RAM. RAM holds Windows and the programs you're actually using, and Windows 7 wants more RAM than Windows XP, but is happy with what works for Vista (if not even slightly less). As discussed in the early chapters of this book, Windows 7 can run with as little as 512MB of RAM and an 800MHz CPU, but it will run a bit slowly, and you'll find the experience somewhat unpleasant. Memory is inexpensive these days, and boosting your RAM to at least 1GB will make a huge difference. I discuss adding RAM and upgrading CPUs later in this chapter. Now, if you're already running Windows 7 on a full-bore, state-of-the-art system, and your computer has a fast video accelerator, a couple of gigs of fast memory, and fast SATA disks, there isn't much more you can do to optimize its hardware. You might just adjust the page file sizes and certainly convert all your partitions to NTFS (which tip is a requirement for Windows 7), or you might add a ReadyBoost device (more on this later in this chapter). Some of the settings you can make are discussed in Chapter 22, "Windows Management and Maintenance;" Chapter 23, "Tweaking and Customizing Windows;" and Chapter 24, "Managing Hard Disks." By the same token, if you're doing common, everyday tasks such as word processing, and you're already satisfied with the performance of your computer as a whole, you probably don't need to worry about performance boosters. Your system is probably running just fine, and the time you'd spend trying to fine-tune it might be better spent doing whatever it is you use your computer for (like earning a living). If you're anywhere between these two extremes, however, you may want to look at the tune-ups and hardware upgrades we'll discuss in this chapter. This chapter just scratches the surface of the ins and outs of hardware installation and updates. If you want all the details, and I mean all the details, get a copy of the best-selling book Upgrading and Repairing PCs, by Scott Mueller, published by Que. • Vista limited ReadyBoost space to a maximum of 4GB (which is all that 32-bit operating systems can handle anyway) for both 32- and 64-bit versions. In Windows 7, 64-bit versions can allocate up to 128GB for a ReadyBoost cache. • Vista limited eligible memory devices to UFDs and SD cards; Windows 7 works with those devices plus Compact Flash (CF), all forms of MemoryStick (MS, MS Duo, MS Pro, and so on), and most other memory cards as well. As with Vista versions, devices must meet minimum speed requirements (12.8 Mbps read/write speeds) for use as ReadyBoost cache devices. • Vista limited ReadyBoost to a single memory device; in Windows 7 you can allocate ReadyBoost cache on multiple memory devices at the same time. When spread across multiple devices performance might not be as fast as when ReadyBoost cache comes from a single device, however. To allocate space on a memory device for ReadyBoost, right-click the drive icon in Windows Explorer, and then click the ReadyBoost tab in its Properties dialog box. 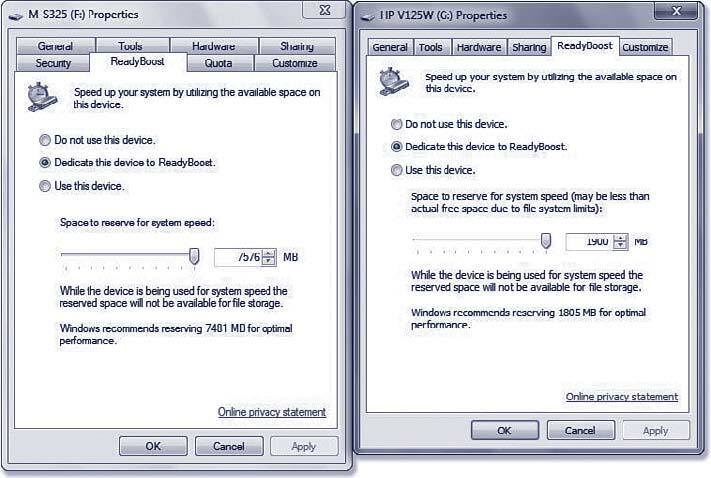 Figure 27.1 shows two different UFDs in use on an x64 Windows 7 machine; the Properties dialog box on the left comes from an NTFS-formatted UFD (NTFS or exFAT are required to create a ReadyBoost cache file greater than 4GB in size), while the box on the right is from a FAT-32 formatted UFD (mixing and matching works fine). In Windows 7, ReadyBoost cache works with multiple devices, where not all formats need be identical. • Set up your BIOS boot order to start with drive C: so that you can skip the floppy stepper motor test. • Disable floppy drive seek. • Turn off any Quick Power-On Self Tests. Some BIOSs have such an option that enables a quicker bootup by skipping some of the internal diagnostics that would usually take place on startup. It makes bootup faster but also leaves you susceptible to errors; some problems will not be detected at startup. Today's computer BIOSs include enough arcane settings that it's possible to alter one in a way that prevents proper booting. Before you mess with advanced CMOS settings (not just simple things such as time, date, boot order, power settings, ports, and so on), read the manual for the computer or motherboard. If you decide to change anything, record the old value before making the change. When in doubt, don't alter advanced CMOS settings that affect how the chipset works, whether and where BIOS and video shadowing is used, and so on. By design, default settings from the motherboard maker work under most situations and OSs. Because Windows is the most popular PC OS, you can bet it has been tested and configured for Windows 9x, NT, 2000, XP, Vista, or Windows 7 (unless your motherboard is very old). That said, what do you do if you've changed something in the CMOS and the computer won't boot? You can try the computer's or motherboard's manual or website for information about Windows 7 settings. If you find nothing, reset all settings to their factory defaults. Most CMOS setups have a Set to Default or similar command you can issue. This should get you out of most any jam. Using the Set to Default option might also be a good course to take if you make CMOS settings that prevent your computer from booting and you can't remember how to undo those changes. Default settings are usually conservative enough to work under most circumstances. The BIOS in some systems may also have a Fail-Safe Defaults option that sets your BIOS to its most conservative settings. One of the most effective improvements you can make to a system is to get a faster or larger hard drive, or add another drive. SCSI hard disks used to seriously one-up IDE drives, but the new breed of Ultra DMA EIDE drives (which I call Old MacDonald Disks -- EIEIO!) and Serial ATA (SATA) drives are speedy and much cheaper than SCSI. An EIDE bus supports four drives (two each on the primary and secondary channels) and is almost always built in to your motherboard. Adding an optical (usually a DVD±RW or a Blu-ray) drive claims one, leaving you with a maximum of three EIDE hard drives unless you install a separate add-on EIDE host adapter or have a motherboard with RAID support. The EIDE spec tops out at 133MBps. SATA supports one drive per channel, but the latest SATA II systems can reach top transfer speeds of 300MBps. Because optical drives also come with SATA connections these days, many new systems skip EIDE in favor of SATA. Many recent motherboards feature onboard IDE and even SATA RAID, which can perform either mirroring (which makes an immediate backup copy of one drive to another) or striping (which treats both drives as part of a single drive for speed). Although the RAID features on these motherboards don't support RAID 5, the safest (and most expensive!) form of RAID, they work well and are much less expensive than any SCSI form of RAID. Just remember that mirroring gives you extra reliability at the expense of speed because everything has to be written twice, and striping with only two disks gives you extra speed at the expense of reliability -- if one hard disk fails, you lose everything. You can now find external terabyte boxes with multiple drives in them that can be set up for striping or mirroring (RAID 0 or 1) at amazingly affordable prices. • Don't put a hard drive and an optical drive on the same channel unless you must. (Put the hard drive on the primary IDE1 channel and the optical drive on the secondary IDE2 channel.) On some computers, the IDE channel negotiates down to the slowest device on a channel, slowing down a hard disk's effective transfer rate. Be sure that the hard drive containing Windows is designated as the Primary Master drive. • Defragment the hard disk with the Defragmenter utility, which you can reach through Computer. Right-click the drive, select Properties, Tools tab, Defragment Now. Do this every week (or run Defrag and set up a schedule so it runs weekly), and the process will take just a few minutes. But, if you wait months before you try this the first time, be prepared to wait a long time for your system to finish. You can also purchase third-party defragmenting programs that do a more thorough job. For more about defragmenting, see Chapter 24. • Get a faster disk drive (and possibly controller if necessary to support the drive): Upgrade from standard Parallel ATA (PATA) to SATA drives if possible. If you have slower (4,200or 5,400RPM) drives, upgrade to quicker ones such as the increasingly popular 7,200RPM or 10,000RPM drives. The faster spin rate bumps up system performance more than you might expect. Purchase drives with as large a cache buffer as you can afford. Drive technology is quickly outdated, so do some web reading before purchase. Perhaps the most cost-effective upgrade you can make to any Windows-based system is to add RAM. This one is a no-brainer: If your disk pauses and thrashes each time you switch between running applications or documents, you need more RAM. Although Microsoft says Windows 7 can run with as little as 512MB of RAM, we found that this results in barely acceptable behavior. At least Microsoft was realistic about it this time around. Microsoft had claimed XP could run with 64MB, but that was a stretch. Running with 64MB caused intolerably slow performance. Windows 7's published minimum is 512MB, but if you run memory-intensive applications and want decent performance, you'll want to up it to 1GB, if not 2. Windows automatically recognizes newly added RAM and adapts internal settings, such as when to swap to disk, to take best advantage of any RAM you throw its way. Upgrade to at least 1GB of RAM if you can afford it, especially if your system uses the economical synchronous dynamic RAM (SDRAM) or double-data-rate (DDR) SDRAM dual in-line memory modules (DIMMs). Memory prices fluctuate constantly, but these days 2GB DIMMs sell for about $25. This is a cost-effective upgrade indeed. But be sure to get the right memory for your motherboard. A huge variety of memory technologies are out there. At the time this was written, common technologies included SDRAM, Rambus DRAM (RDRAM), DDR, DDR2, and DDR3. Memory speeds range from 100MHz (labeled PC100) to 2200MHz (labeled DDR3-2200). Also, there are error-correction code (ECC) and non-error-correcting RAM varieties (desktop and notebook PCs use non-ECC RAM). For more about RAM developments and technology, go to https://en.wikipedia.org/wiki/Random_access_memory. To find out what type of memory you need, check with your computer manufacturer or the manual that came with your computer or motherboard. Get the fastest compatible memory that your CPU can use and that your motherboard supports. You can get RAM that's rated faster than you currently need, but you won't gain any speed advantage -- just a greater likelihood of being able to reuse the memory if you later upgrade your motherboard. Here's a website with some good information about RAM and even possibly what kind your computer uses: www.pcbuyerbeware.co.uk/RAM.htm. The maximum amount of RAM you can use depends on your computer's hardware and the version of Windows 7 you are using. The following table lists the version and maximum amounts. Many last-generation computers cannot use more than 4GB of memory, and that's all that 32-bit versions of Windows can address, even if you could plug it in without a BIOS upgrade. Check with the computer or motherboard manufacturer's data sheets or website to figure out whether you have to flash upgrade the system board BIOS to support more than 4GB of RAM. Microsoft has changed its nomenclature with Windows 7. What used to be called the Windows Compatibility List or Hardware Compatibility List (also abbreviated HCL) is now called the Windows Logo'd Products List. If you want to make life easy for yourself, before you purchase hardware for your Windows 7 system, check thelists on the Microsoft site (look for Windows 7 items at https://winqual.microsoft.com/hcl/default.aspx. Or when looking on a box in a store or online, it should have a "Certified for Windows 7" or "Windows 7" logo on it.